Pyramix Studios is situated in a private wooded and secluded setting. The studio, along with its parking and facilities, are in a secure gated area providing privacy and discretion. We ensure that no unwanted guests will crash your party. In addition to the basics, we also offer an outdoor lounge, a kitchenette and rest facilities, an indoor lounge with house sound, and supplemental seating for events. No matter what your project or event is, we're here to make sure you have everything you need. 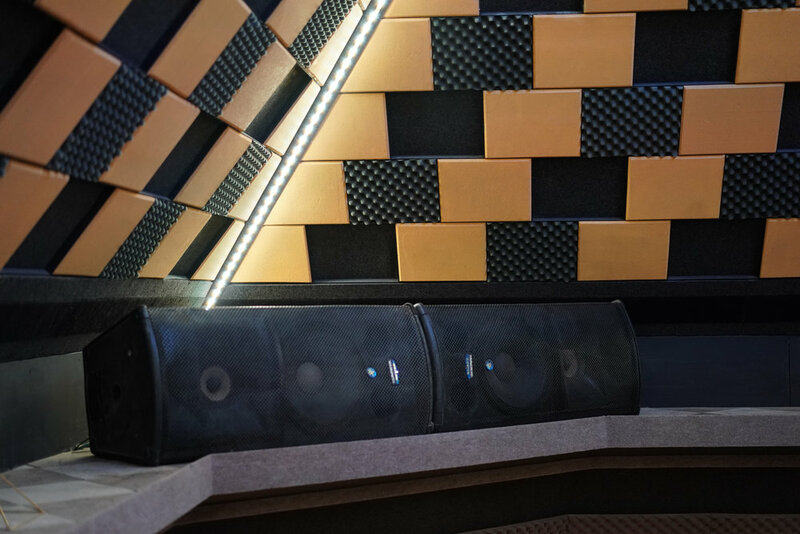 Inside the studio you'll find an incredible, unique live recording room. Drums, vocalists, and even full live bands have a sound in this room that can't be found anywhere else. We can comfortably accommodate and record acts of nearly any size. Our live room has multiple workstations, each of which has its own lighting control and personal headphone mix station. Modular cable routing allows for any number of floor configurations to cater to any instrument or artists' equipment and sound. When it's time for more precision and control, our isolation booth is up to the task. Whether you're working with a vocalist, a delicate acoustic guitar, or a screaming half-stack, our booth will make sure the sound is captured without any unwanted content. Like the live room workstations, the isolation room also has independent lighting control and easy-to-control headphone mixes. Quiet climate control also allows the artist to maintain their optimal comfort level. Our state-of-the-art control room lets you hear every step of the recording and mixing process with perfect fidelity. The streamlined console puts everything the engineer needs right at their fingertips, and our convenience enhancements make every task easy. A workstation facing the isolation room window offers producers a place to visually connect with their talent or use MIDI hardware to build a performance. The control room is lined with comfortable seating for everyone else who's involved. To make artists, producers, managers, and even groupies more comfortable, we have an indoor lounge overlooking the live room. With sofas, tables and chairs, and bar seating, everyone has a place to be comfortable during downtime or tracking time. Guests in the lounge can listen to the recording process through headphones (with their own custom mix) or, if the microphones are off, through a house sound system that fills up the room. The lounge is also equipped as an additional recording space.